X Even if its body is torn, it can regenerate as long as the glowing central core remains intact. X Auch wenn sein Körper nicht mehr intakt ist, kann es sich regenerieren, wenn der Kern leuchtet. X Même si son corps est détruit, il peut se régénérer aussi longtemps que son cœur est en bon état. X Aunque sus brazos se rompan podrán regenerarse, siempre y cuando su núcleo siga intacto. X Anche se il corpo è lacerato, continua a rigenerarsi finché il nucleo ardente centrale rimane intatto. X 몸의 중심에서 빛나는 핵이 있는 한 몸이 찢겨나가도 재생할 수 있다. Y It appears in large numbers by seashores. At night, its central core flashes with a red light. Y Es taucht in großer Anzahl an Ufern auf. Nachts leuchtet der Kern in seiner Mitte rot auf. Y On peut voir des Stari en grand nombre près des côtes. La nuit, le centre de son corps clignote d’une lumière rouge. Y Suele aparecer en grupos en la orilla de la playa. Por la noche, el órgano central que tiene brilla con una luz roja. Y Se ne trovano molti in riva al mare. Di notte, il nucleo al centro del corpo lampeggia di una luce rossa. Y 해변에 많이 나타나며 밤이 되면 가운데가 빨갛게 깜박거린다. 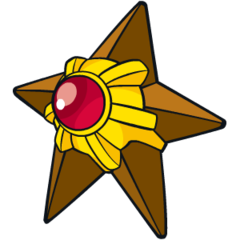 Omega Ruby Staryu apparently communicates with the stars in the night sky by flashing the red core at the center of its body. If parts of its body are torn, this Pokémon simply regenerates the missing pieces and limbs. Omega Ruby Sterndu kommuniziert mit den Sternen am Nachthimmel, indem es den roten Kern in seiner Körpermitte blinken lässt. Wenn Teile seines Körpers beschädigt wurden, stellt es die fehlenden Teile selbst wieder her. Omega Ruby Stari communique apparemment avec les étoiles dans le ciel en faisant clignoter son cœur rouge. Si des parties de son corps sont cassées, ce Pokémon les régénère. 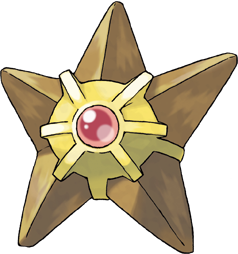 Omega Ruby Staryu parece comunicarse por la noche con las estrellas haciendo brillar el núcleo rojo de su cuerpo. Si este Pokémon sufre algún daño en alguna zona de su cuerpo, la regenerará sin problema. Omega Ruby Pare che la notte Staryu comunichi con le stelle facendo brillare il suo nucleo rosso al centro del corpo. In caso di perdita di qualche appendice questo Pokémon riesce a rigenerarla senza problemi. Omega Ruby 가운데에 있는 빨간 코어를 점멸시켜 밤하늘의 별과 교신하는 것 같다. 몸은 찢겨 나가더라도 스스로 재생한다. Alpha Sapphire Staryu’s center section has an organ called the core that shines bright red. If you go to a beach toward the end of summer, the glowing cores of these Pokémon look like the stars in the sky. Alpha Sapphire In Sterndus Körpermitte befindet sich ein hellrot leuchtendes Organ – sein Kern. Wenn du im Spätsommer an einen Strand gehst, sehen die leuchtenden Kerne dieser Pokémon aus wie Sterne. Alpha Sapphire Au centre de Stari se trouve un organe rouge et brillant appelé le cœur. À la fin de l’été, sur les plages, les cœurs de ces Pokémon brillent comme les étoiles dans le ciel. Alpha Sapphire Staryu posee un órgano central, conocido como su núcleo, que brilla con una luz roja. A finales de verano, pueden verse en la playa los núcleos de estos Pokémon brillando como las estrellas del cielo. Alpha Sapphire Al centro del corpo di Staryu è presente un nucleo che brilla di un rosso intenso. In spiaggia, a fine estate, il nucleo di questi Pokémon ha l’aspetto delle stelle nel firmamento. Alpha Sapphire 여름이 끝날 무렵 밤에 모래 해변에 가면 핵이라고 불리는 기관을 붉게 빛내는 별가사리가 별처럼 보인다. Sun Large numbers of these Pokémon make their home at the seaside. At night, a strange red glow radiates from the center of their bodies. Moon This Pokémon gets nibbled on by Lumineon and others. Thanks to its red core, it regenerates fast, so it’s unconcerned by their snack attacks. Red An enigmatic Pokemon that can effortlessly regenerate any appendage its loses in battle. Blue An enigmatic Pokemon that can effortlessly regenerate any appendage its loses in battle. Yellow As long as the center section is unharmed, it can grow back fully even if it is chopped to bits. Stadium It is capable of growing back any portion of its body that is cut off. At night, the center core glows with a red light. Gold At night, the center of its body slowly flickers with the same rhythm as a human heartbeat. Silver Even if its body is torn, it can regenerate as long as the glowing central core remains intact. Stadium2 At night, the center of its body slowly flickers with the same rhythm as a human heartbeat. Ruby Staryu's center section has an organ called the core that shines bright red. If you go to a beach toward the end of summer, the glowing cores of these Pokemon look like the stars in the sky. Sapphire STARYU apparently communicates with the stars in the night sky by flashing the red core at the center of its body. If parts of its body are torn, this POKeMON simply regenerates the missing pieces and limbs. Emerald It gathers with others in the night and makes its red core glow on and off with the twinkling stars. It can regenerate limbs if they are severed from its body. Pearl If its body is torn, it can grow back if the red core remains. The core flashes at midnight. Platinum If its body is torn, it can grow back if the red core remains. The core flashes at midnight. Black If its body is torn, it can grow back if the red core remains. The core flashes at midnight. White If its body is torn, it can grow back if the red core remains. The core flashes at midnight. Black 2 As long as its red core remains, it can regenerate its body instantly, even if it’s torn apart. White 2 As long as its red core remains, it can regenerate its body instantly, even if it’s torn apart.